This campaign has concluded, but if you would like to still make a gift to support the work of architecture and design students, please click here. Professor Paola Sanguinetti’s design+build Studio 509 students have collaborated this semester on an effort to revitalize an abandoned area behind Marvin Studios. 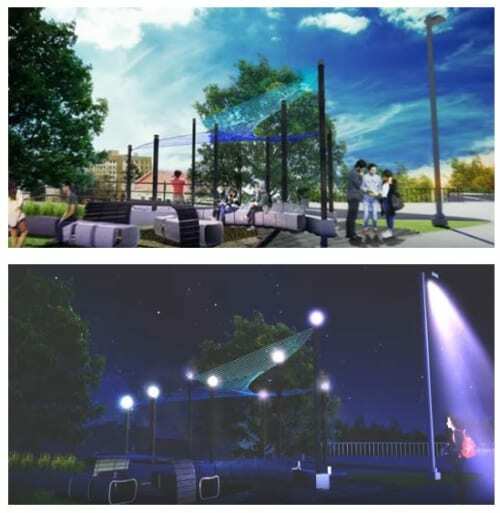 Project RITA has focused on creating a Relaxing, Interactive, and Therapeutic Atmosphere for students. We have found that students are present and working in Marvin Hall and Chalmers Hall round-the-clock, and our site could best serve them as a space dedicated to promoting their mental and physical well-being. We want to provide students with a beautiful space that capitalizes on great views of campus, where they can gather to relax, socialize, and interact with art and nature. 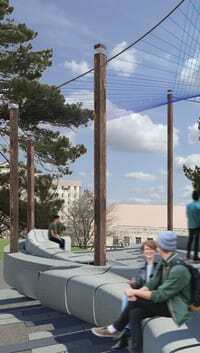 To achieve our goals, we have designed an engaging art piece, sitting area, and gathering space to be utilized by KU students, faculty, and visitors to campus. We have put substantial effort into obtaining donated construction materials, and have found local donors who have generously supplied the bulk of the necessary materials. However, we need your help to cover the remaining cost of materials! We have worked very hard to develop a beautiful, purposeful, and lasting contribution to the School of Architecture, Design, and Planning, but construction won’t be possible without your support! Please consider a gift of any size. All donors will be invited to our project reveal and reception (tentatively scheduled for May 8th, if we can stay on schedule with construction). Mark your calendar! Thank you for your consideration, and we hope to see you in May! For more information about the project, please visit our website www.projectrita.wordpress.com. Help us lay the foundation for Project RITA. All donors will be invited to the reception and will have their name engraved, exactly as it appears publicly on the donor wall. If you make your gift anonymously, we will not engrave your name. Build the support necessary to meet our goal. All donors will be invited to the reception and will have their name engraved, exactly as it appears publicly on the donor wall. If you make your gift anonymously, we will not engrave your name. Keep our project running smoothly. All donors will be invited to the reception and will have their name engraved, exactly as it appears publicly on the donor wall. If you make your gift anonymously, we will not engrave your name. Supply our project with materials & equipment. All donors will be invited to the reception and will have their name engraved, exactly as it appears publicly on the donor wall. If you make your gift anonymously, we will not engrave your name. Take the lead on supporting this project. All donors will be invited to the reception and will have their name engraved, exactly as it appears publicly on the donor wall. If you make your gift anonymously, we will not engrave your name. Invest in the well-being of Architecture & Design Students. All donors will be invited to the reception and will have their name engraved, exactly as it appears publicly on the donor wall. If you make your gift anonymously, we will not engrave your name.